Coordinator of Government Activities in the Territories points out to Gazans that terrorism affects their economy. The Coordinator of Government Activities in the Territories (COGAT), Kamil Abu-Rukun, on Friday urged the people of Gaza to choose economic growth over terrorism. "When terror grows, the Palestinian economy declines,” Abu-Rukun wrote in a post on COGAT’s Arabic-language Facebook page. “In 1992 more than 90,000 Gazan workers entered Israel every day, but since then the number has dropped to 0. The terrorist organizations are undermining the stability and the Palestinian economy. Residents of Gaza, the choice is yours: Terrorism or economic growth." His comment came as thousands of Arabs once again held violent riots along the Gaza border. The rioters hurled several firebombs and IEDs at IDF soldiers. No injuries were reported. In addition, several suspects crossed into Israel and then immediately retreated to the Gaza Strip. IDF troops responded with riot dispersal means and fired according to standard operating procedures, said the IDF Spokesperson’s Unit. The violent riots along the Gaza border have been ongoing since March 30. 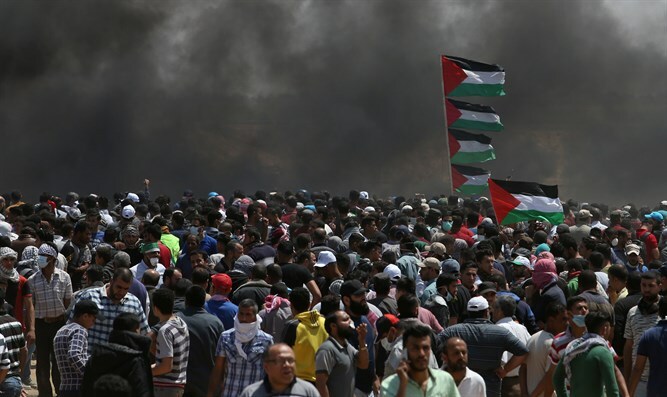 In addition to attempting to infiltrate into Israel, the Arab rioters have been using kites and balloons with explosives attached in order to set fire to Israeli property.